Internet Explorer on the User client. LyncMicrosoft Lync (formerly Microsoft Office Communicator) is an instant messaging program designed for business use and is the successor of Windows Messenger. In order to use Lync, a Microsoft Lync Server is required. or Skype for BusinessSkype for Business (formerly Microsoft Office Communicator and Microsoft Lync) is an instant-messaging client used by Anywhere365. In order to use SFB, a Microsoft Skype for Business Server is required. Skype for Business is enterprise software; compared to Skype, it has different features that target businesses. client. Silverlight version 5 or higher on the User Client. For the Extension Window to work a plugin needs to be loaded in the UCC. Note If your plugin isn't in this list, then the information can be requested at the Support Team. An interface between Anywhere365 and Active Directory. An interface between Anywhere365 and AFAS Profit Online. An interface between Anywhere365 and ConnectWise Plugin. An interface between Anywhere365 and a CSV File. An interface between Anywhere365 and Dynamics 2011. 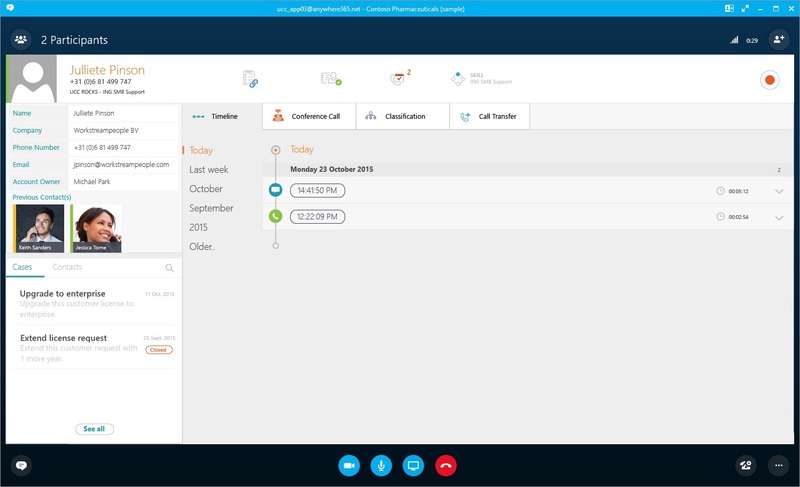 An interface between Anywhere365 and Dynamics 2013. An interface between Anywhere365 and Dynamics 365. An interface between Anywhere365 and SalesForce. An interface between Anywhere365 and ServiceNow. An plugin to enable the Extension window without backoffice. Log in on the server on which the UCC service is running. In IIS choose option ‘Convert to Application’. A popup will appear. Click on the select button to choose the 'UCCServiceApplicationPool' application pool. To verify select 'Browse *' on the right side of IIS. Replace the 'ucc.domain.com' with the correct FQDNA fully qualified domain name (FQDN), sometimes also referred as an absolute domain name, is a domain name that specifies its exact location in the tree hierarchy of the Domain Name System (DNS)..
Verify the URL by opening it in a browser. "Name"="Cases CRMCRM stands for Customer Relationship Management and is a method/technology for managing contacts of customers. CRM helps to offer each customer an individual value proposition based on its wishes. In addition, CRM makes it visible which  customers represent higher value for the organization and therefore might be served in a different way. extension"
Note After running the registry settings file, it is a good practice to shut down and restart the Skype for Business client. Otherwise Skype for Business might not use the changes caused by the registry file in a proper way. TipIf the user cannot run the registry key and you need to run as another user. You can replace "HKEY_CURRENT_USER" "HKEY_USERS\<USER_SID>". You can find the User_Sid with the command "whoami /user". Place in Certificate store "Trusted Publisher"